California was the perfect place for us to spend 6 weeks of spring as we got used to the full-time RV life. Even though Christian grew up in Southern California, he had no idea how diverse the state was. We’re so glad we were able to explore so much of the state (along with visiting a bunch of friends and family!) and we now have a wish list of places we’d love to go back to – of course. Does anyone else have this problem when they travel? Here’s a recap of the places we stayed and some of the things we did. More in-depth posts will be coming to the blog in the coming weeks, so I’ll be sure to link up when they’re published! 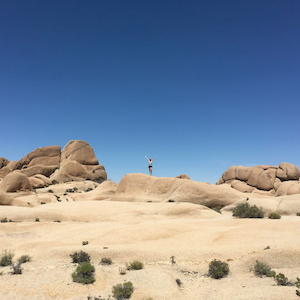 Our first stop in California was Joshua Tree National Park – we drove in from Phoenix and camped at Joshua Tree Lake. It was not too crowded in early May and close enough to the park that we were able to do a day trip. While you can definitely do Joshua Tree in a day (which we did) it seems like part of the magic of the place is being able to tent camp there. To be honest, we’re not really desert people (although we are 100% dessert people!) but if/when we come back this way, we’ll plan on spending a night or two actually camping in a tent. From Joshua Tree, we drove to San Diego to stay in our awesome friends’ driveway. High fives for friends with super long driveways! While we were there, we celebrated Cinco de Mayo in Encinitas + attended a Padres game. One of Christian’s goals is to visit every MLB stadium + he’s at 17 so far! After a super fun weekend in San Diego, we headed up to the LA area where a lot of Christian’s family lives. We stayed at Glen Ivy RV Park in Corona, which was quite a ways outside of town, but can you really experience Los Angeles properly without sitting in traffic for hours? While we were in the area, we explored Long Beach, Venice Beach and Corona del Mar. 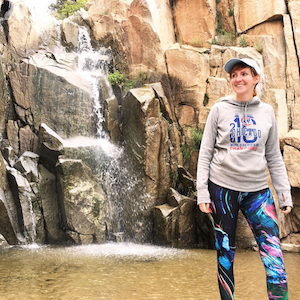 We also hiked to Ortega Falls in Lake Elsinore which was a nice break from all the city traffic. Of course, the best part of being in LA was seeing family, + you can listen to more about what we learned during our time there in Episode 35. Despite the recent mudslides + closures, we really wanted to spend as much time driving up the coast as we could – so our next stop was Vandenberg Air Force Base. We stayed at Fam Camp, boondocking one night + then another few nights with hookups. Hear about our experience there in Episode 37. There was something so surreal about driving our RV up the 101, overlooking the Pacific Ocean. It’s one of those classic California experiences that we highly recommend. Unfortunately, I was sick during pretty much our entire stay here so I didn’t do much but sleep (Christian was a trooper!) 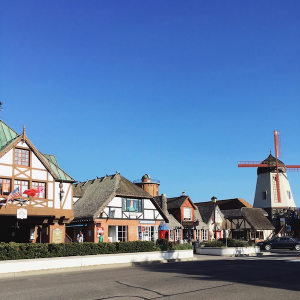 but we did make it out to the Danish-inspired city of Solvang for one afternoon. At this point, we left the coast and headed back inland to stay with friends in Fresno. Another high five for friends with long driveways! And guys, it was HOT in Fresno. Thankfully, we were able to plug into our friends’ garage so that we could keep the fan running for Cowboy. We used this spot as a home base for day trips to Yosemite, King’s Canyon + Sequoia National Parks. We saw bears at both parks – so keep an eye out for the upcoming vlog! One word of caution: visiting Yosemite on a Saturday in May is basically asking for trouble. We were stuck in traffic for HOURS (but at least it gave us a chance to record this podcast episode on systems). We decided to hold off on our visit to Sequoia until Monday + had a much, much more relaxing + National Park-esque experience. Have you sensed a pattern yet? We have liked finding a home base for Gulliver and taking side trips in our Jeep without worrying about where to park the RV. Christian has a cousin stationed at Travis Air Force Base so we camped at the base’s RV park. They have been stationed in Germany for the last 5 years so it was a treat to be able to spend so much time with them! From Travis, we explored San Francisco, Napa, Sacramento (where we interviewed our friend Jen!) + did a day trip drive up the coast from Santa Cruz to Half Moon Bay to have lunch with the scientists from our Antarctica trip. This was one of the prettiest drives so far – we especially recommend stopping at Shark Fin Cove and tasting strawberries at Swanton Farms. Our next campsite was at Lassen Volcanic National Park – one of the best unknown spots we uncovered. We would never have heard about it without our National Parks pass but we really enjoyed our time at Manzanita Lake Campground. Despite the fact that we were there in early June, most of the park was still closed due to winter snow! There are lots of perks to exploring off the beaten path, which we chatted about in Episode 39. Our favorite hikes of the park (that were accessible to us in the snow) were Crags Lake and the Lily Pond loop. After cooling off under the snow in Lassen, we headed back to the coast for Redwoods National Park. To this day, I daydream about our time at the Redwoods – it was unbelievably beautiful. We camped at Chinook RV Resort, with a pull-thru spot right on the Klamath river where seals would swim up from the ocean in the evenings and bald eagles flew overhead. Yes, it really was as dreamy as it sounds. This campsite was also in a nice central location for all the things we wanted to do in the parks (detailed post + vlog to come!) but beware, the internet is very spotty so keep that in mind if you’re working from the road like we are. Listen to our Redwoods podcast episode. 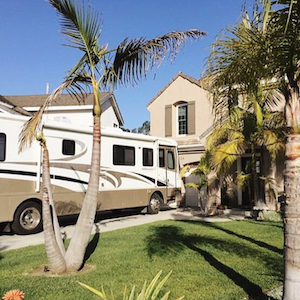 Are you planning on visiting California in your RV? Let us know if you have any questions: the RV community was so kind + helpful to us when we were just getting started so we’re happy to pay it forward!